From the moment Top Chef premiered on Bravo in March 2006, I have been a fan. I couldn’t help but be drawn in by a reality television show focused on food. It isn’t enough for me to just watch the drama unfold. I need to taste the food. This means dining at restaurants or attending events featuring Top Cheftestants here in DC, as well as when I travel to other cities. 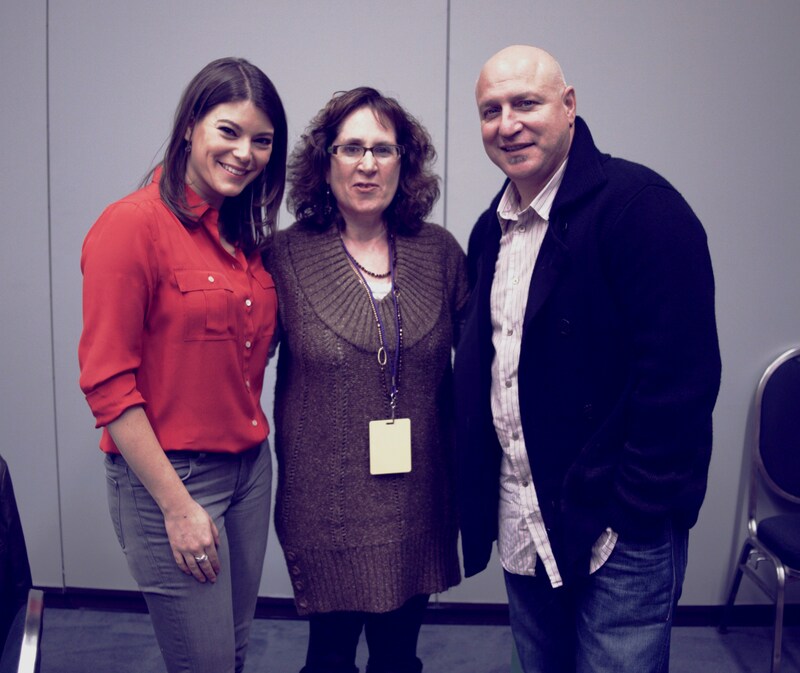 One of my primary motivations for attending this past weekend’s The Metropolitan Cooking & Entertaining Show held at the Walter E. Washington Convention Center, is the opportunity to see a cooking demonstration by Top Chef judges Tom Colicchio and Gail Simmons. So when Jill Collins, of Jill Collins Public Relations Group, offers me an opportunity for an interview with Colicchio and Simmons, my excitement is palpable. She gives me a bit of advice: “Don’t gush,” she says. I’m grateful for the reminder because if there’s anything I’m apt to do when meeting a top chef, it’s gush. Although even my daughter has to admit that I handled myself with great restraint when she and I dined at the kosher Prime Grill in New York, where Top Chef Season Three winner Hung Huynh was cooking for a time. (She was initially mortified when I asked if we could meet him. She was grateful when I didn’t embarrass her.) I probably would have embarrassed her greatly the day I stopped Fabio Viviani, currently one of the star’s of Bravo’s Life After Top Chef, at the O’Hare Airport for a quick chat. It’s a spur of the moment interview opportunity, so I am not exactly prepared. But if there is one subject that I can talk about with some degree of knowledge, it’s Top Chef. I am ushered into a room and there, seated at a table waiting for me, are Tom Colicchio and Gail Simmons. Gasp…. I take a deep breath and settle in with some questions. We chat a bit about Season 10 of Top Chef, which premieres this week, and I ask about the DC chefs in the cast, including Dan O’Brien, who is chef/owner of Seasonal Pantry. “We know them by their names more than where they are from,” says Colicchio. Obviously they can’t really comment on a contestant before the show has aired. But I mention it in the context of a restaurant where reservations may be difficult to obtain after the week. At the time, I don’t remember that another DC chef is also in Season 10: Bart Vandaele of Belga Café, along with Jeffrey Jew who previously led the kitchens at Marvin, BlackByrd, and the Brixton, but now lives Florida. Neither Colicchio or Simmons is involved in the production of Life After Top Chef, which is my current Top Chef obsession, although they both appear in an early episode that takes place at the Food & Wine Classic in Aspen. 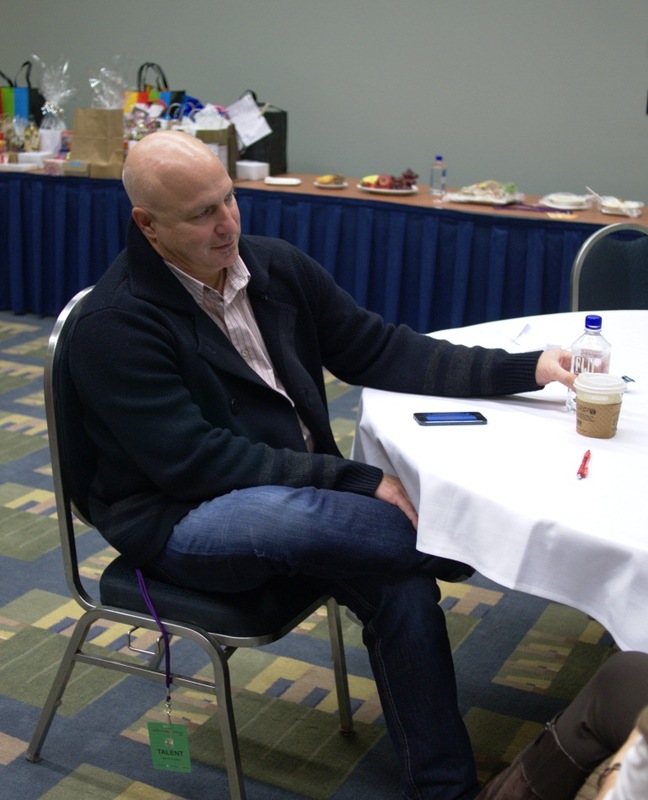 Colicchio says he also appears in a future episode with Michelle Obama. What can we expect in Season 10 which premieres this Wednesday, November 7? They can’t tell me much but Colicchio says that the selection process has changed and chefs have to cook their way in, through small group competitions. Go here for a sneak peak of the first episode. I wonder if some of the adventure competitions that we saw in Season 9 will be repeated. I don’t really get an answer, but I do find out that “Last Chance Kitchen” is back. This means that chefs who are eliminated get a chance to cook their way back into the competition. I wonder if the fact that the chefs may be expecting this has any effect on the results. Colicchio thinks the chance to return is a good thing, because people can take more risks with their dishes if they think that getting cut may not be permanent. One of the many fun things about this interview is that I get an inside view of the camaraderie between Simmons and Colicchio. They have been working together for six and a half years and it shows. It’s even more evident during their cooking demonstration in the celebrity theater. They tease and cajole, but clearly get along well. Colicchio seems very much like his television personality. He is intense, but he has a good sense of humor as well. While Simmons exhibits a stern side when she is judging food, in person she is warm and bubbly. When I ask about the Top Chef Cruise scheduled for April 2013, she gets excited. “It will make the Top Chef experience three-dimensional for the fans,” she says. There will be demos, parties, and special events. When I first read about the cruise, it seems a bit over the top. But the more I learn, the more I want to hop aboard. Tom’s strangest Top Chef moment: seeing Padma in a bathrobe and curlers. For the most part judges are kept away from the chefs, so the viewing public sees more of the cheftestants’personalities than the judges do. Tom likes when chefs challenge them at judges table. In fact, sometimes he thinks they don’t talk back enough. Gail and Tom agree that one of their favorite dishes ever on Top Chef is a dashi broth soup made by Season 9 winner, Paul Qui. Gail says it’s one of the most delicious things she has ever eaten. Gail builds her skills by traveling and tasting new things. Tom says they discern winners and losers one dish at a time, rather than collectively throughout the season. Sometimes it’s an easy day at work, and the decision is clear. But the best days are when all the food is good, and then it’s about nitpicking. The night before the Metropolitan Cooking & Entertaining Show, I dream that I arrive too late to see the Tom Colicchio and Gail Simmons cooking demonstration. I am distraught. I awaken and am thoroughly relieved to find it was just a dream. These are two people that I admire as a Top Chef fan, and some may say fan-atic. 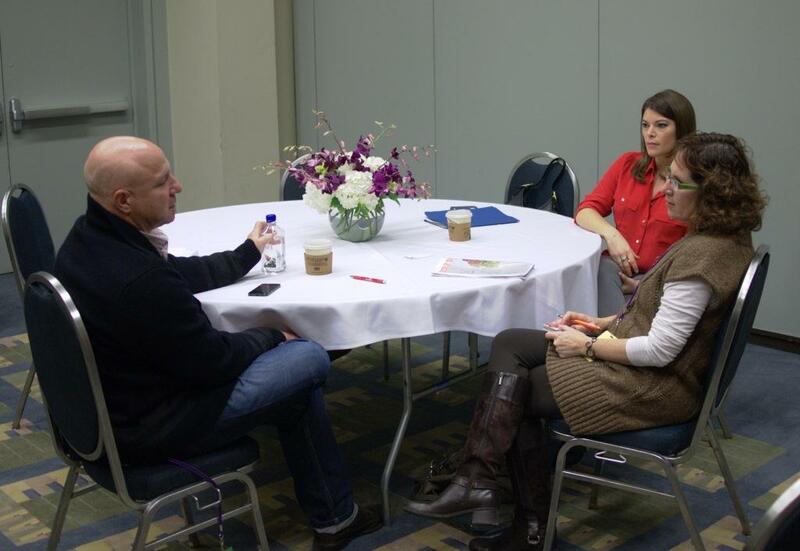 People have been asking me what it was like to sit down with Colicchio and Simmons. It was definitely a privilege, and it was certainly surreal…kind of like a dream. Top Chef Seattle premiers Wednesday, November 7 at 9:00 pm (edt) on Bravo.